The Water Resource Inventory Area (WRIA) 7 Routine Streams Monitoring Program was established during 2011 and consists of twelve sampling sites that are distributed throughout the Snoqualmie and Skykomish watersheds. Historically in King County, routine streams monitoring has been centered on WRIA 8 (Lake Washington/Cedar/Sammamish) and WRIA 9 (Green-Duwamish). 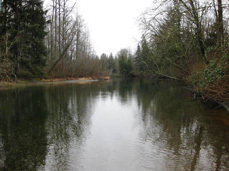 However, in 2011 a Surface Water Management (SWM) fee increase allowed King County to expand its regular water quality monitoring efforts to include the King County portions of the WRIA 7 drainage. Objectives of this program are focused on quantifying long-term water quality trends to help inform the management of salmon recovery efforts, land use regulation, and to prepare for expected increases in climate variability. King County collects monthly water quality samples on the South Fork of the Snoqualmie River at Snoqualmie Valley Trail Bridge, just north of the City of North Bend, Washington. King County is not currently conducting benthic macroinvertebrate or stream sediment monitoring in the WRIA 7 Routine Streams Monitoring Program. The South Fork Snoqualmie originates near Snoqualmie Pass and flows more than 30 miles before joining the mainstem Snoqualmie near the City of North Bend, Washington. Total contributing area above the sampling location is greater than 52,000 acres. For most of its length, the South Fork follows Interstate 90. Most of the watershed is within the Mount Baker – Snoqualmie National Forest, and Olallie and Twin Falls Washington State Parks. The South Fork flows through the City of North Bend before passing through King County owned Tollgate Farm32, Mount Si Golf Course, and a small portion of the Three Forks Natural Area at the confluence with the mainstem (Kaje, 2009). Total land use in the South Fork Snoqualmie River basin is dominated by forest (mostly evergreen) followed by scrub, developed, and other (barren land, grassland, and open water). Agriculture, as well as wetlands, represent a very small proportion of land use. See Table 1 below for more details on land use. Resident cutthroat trout, rainbow trout, and mountain whitefish are found in the mainstem and numerous tributaries of the South Fork, with cutthroat ascending into headwater areas. A Water Quality Index (WQI) rating system was developed by Ecology that evaluates several water quality parameters and gives a single rating of “high,” “moderate,” or “low” water quality concern. To see how South Fork of the Snoqualmie River ratings compare with other stream sites, please visit the Water Quality Index webpage. King County is not currently operating any stream, rain, or temperature gages on the South Fork of the Snoqualmie River. However the U.S. Geological Survey (USGS) does operate a stream gage on the South Fork above Alice Creek near the town of Garcia, Washington (12143400). While King County is not conducting benthic macroinvertebrate monitoring on the South Fork of the Snoqualmie River as part of the WRIA 7 Routine Streams Monitoring, King County (Roads) collected benthic data from several tributaries of the South Fork in 2010. To see this data, please visit the Puget Sound Stream Benthos webpage.